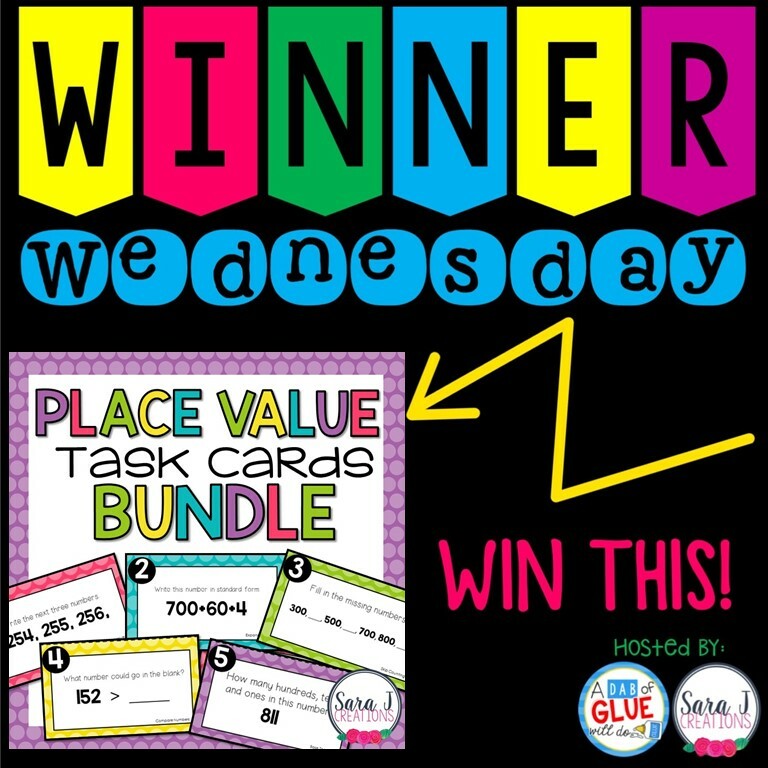 It is Winner Wednesday! That means a lucky reader gets to take home my Place Value Task Card Bundle. All you have to do is enter below to win. Remember, there are other fabulous products being given away by other teacher authors. Just check the links below. Want to join us next month in showcasing a product and then giving it away to a lucky reader? You can find all the Winner Wednesday information HERE. My Place Value Task Card Bundle includes each of the five sets described below. 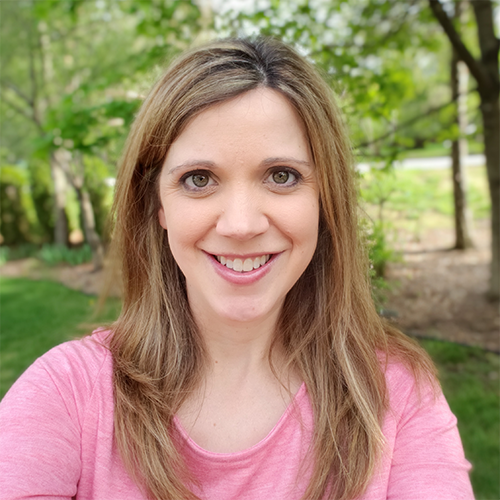 If you are looking for ideas of how to use task cards in your classroom, check out my post about 12 ways to use task cards. A task card has just one question on it at a time. Students record their answers and move on to the next task cards. There are so many ways you can use these - small group, math centers, preassessment, assessment, whole class games, etc. Let's take a look at the task card sets that are included in the bundle. *You can put restrictions on this if you want and tell them the answer has to be smaller than 1,000 if you want to stick to 3 digit numbers and have a little more control over the numbers they pick. Expanded form task cards focus on breaking the numbers into hundreds, tens and ones and knowing the value of each number. This set includes 3 types of problems. Place Value task cards are designed as an overview of the concept of place value. Base ten task cards focus on counting numbers using base ten blocks to help. This set includes 3 types of problems. Place card free sample task cards include a few cards from each set. It is a chance to try out the task cards and see what area of place value your students need more practice with or what area you want to focus on more specifically. Ready to win?? Enter your name in the rafflecopter below for your chance to win. Winner will be notified Thursday morning. 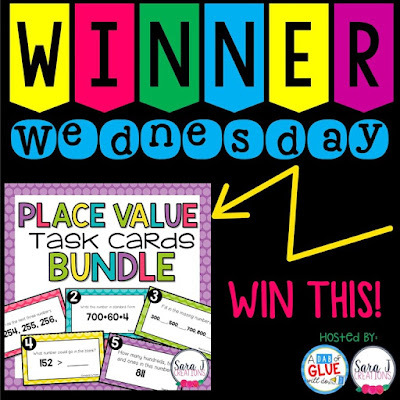 Didn't win but still want to use place value task cards? 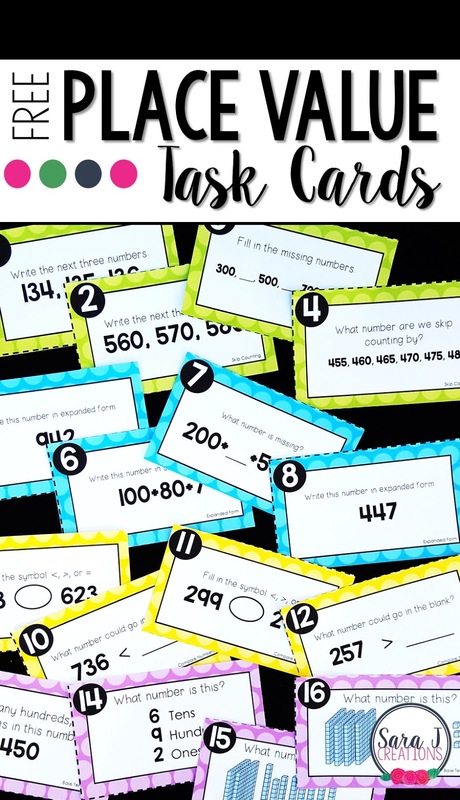 Grab my place value task cards bundle now! Check out some other Winner Wednesday giveaways below!